In a study that’s bound to attract considerable controversy, a pair of researchers are claiming that between 60 and 66 percent of all cancer-causing mutations are the result of random DNA copying errors, making them essentially unavoidable. 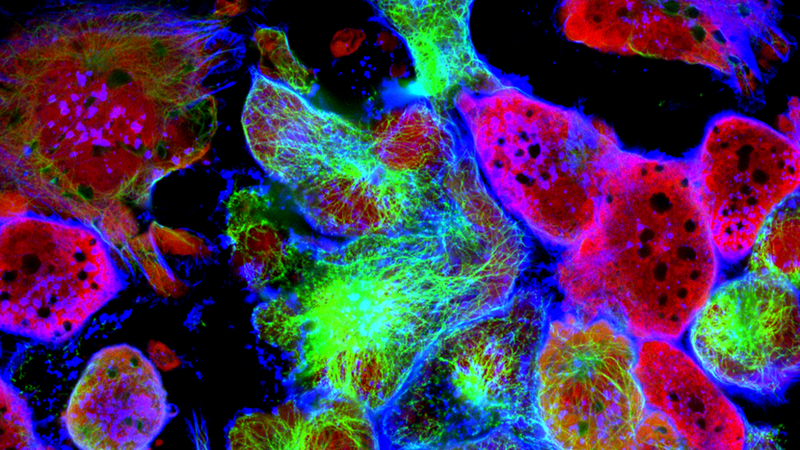 The new research is offering important insights into how cancer emerges, and how it should be diagnosed and treated—but many questions remain. For decades, the paradigm among cancer researchers has been that cancer arises as the result of heredity or environmental factors, or a combination of the two. New research from Johns Hopkins Kimmel Cancer Center suggests there’s a third factor that causes mutated cells to start reproducing out of control—random and unpredictable copying errors during DNA replication. Upsettingly, the research shows that these errors occur in people who don’t have a family history of cancer, and among those who lead very healthy lives. This revelation suggests improved methods to detect cancer are needed, especially in the early stages when cancers are highly curable. As the authors conclude in the new paper—published today in Science—random DNA copying glitches appear to be responsible for nearly two-thirds of all cancer mutations. The researchers informally refer to cancers that develop in this way as “bad luck” cancers because there’s evidently nothing we can do to avoid them. But as the scientists go to great pains to point out, that’s not an excuse to live one’s life with reckless abandon. As this new paper and pre-existing studies show, approximately 40 percent of cancers can still be prevented. Tomasetti, along with his colleague Bert Vogelstein, reached this conclusion by using a new mathematical model to evaluate DNA-sequencing data and epidemiological findings from around the world. Among the 32 cancer types studied, the researchers found that approximately 66 percent of cancer mutations are the result of DNA copying errors, 29 percent are caused by environmental factors, and just five percent are hereditary. A study published in 2015 by Tomasetti and Vogelstein reached a similar conclusion, but it kindled a firestorm of controversy by excluding certain cancers, and by only considering US cancer patients. Given the role environmental pollutants and other toxic agents play in cancer, it was not unreasonable to suggest that the causes of cancer may vary globally. What’s more, the researchers failed to determine the fraction of the mutations in cancers caused by DNA copying errors; the researchers only compared cancer incidence to the total number of cell divisions in the organs in which the cancers occurred. “The two studies are different in many ways, and includes things we hadn’t done before,” Tomasetti told Gizmodo. This time, the researchers included breast and prostate cancer, which they had previously excluded before on account of insufficient data, and they collected cancer data from around the world. For the study, the researchers compared the number of stem cell divisions—an important source of cell mutations—among cancer patients from 68 countries listed in 423 registries monitored by the International Agency for Research on Cancer. Tomasetti and Vogelstein found strong correlations between cancer incidence and cell divisions not influenced by hereditary or the environment among the cancer types studied, regardless of the country’s environment or economic output. Looking at the mutations that drive abnormal cell growth, the researchers developed a statistical model using DNA sequencing data from the Cancer Genome Atlas and epidemiologic data from the Cancer Research UK database. An interesting discovery is that it takes approximately two gene mutations for cell division to get out of control and become cancerous—but not all mutations results in cancer. While across the board, these “bad luck” cancers account for about two-thirds of all cancers, each cancer type has its own story to tell. In pancreatic cancer, for example, 77 percent of cases are the result of random DNA copying errors, 18 percent are due to environment, and the remaining five percent to hereditary. For prostate, brain, and bone cancers, the “random” (R) factor jumps to 95 percent (the researchers defined R as mutations caused by normal DNA replication, and not those influenced by inherited genetic factors and/or the environment). Most of the mutations in breast cancer were attributed to R, but some were due to health factors (obesity being a contributing factor). Lung cancer is quite different, with the environment accounting for 65 percent of cases (attention smokers). Around 35 percent of lung cancer is the result of copying errors, while heredity plays a virtually non-existent role. Vogelstein hopes that this work will inspire researchers to better understand the risk factors involved, and to devise novel prevention measures. He also says that secondary prevention of cancer—that is, treating cancer as soon as it appears—is a grossly undervalued and under-researched component of cancer research, and that this study should serve as a wake-up call in that regard. Like their 2015 study, this research is guaranteed to attract attention—and a hefty amount of scrutiny. Wu’s colleague and collaborator, Yusuf Hannun from the Stony Brook Cancer Center, also has misgivings about the updated research. “The flaw with their logic from the previous study persists: the correlation between stem cell division and tissue specific cancer risk,” he told Gizmodo. Hannun points out the correlation doesn’t imply a causative role for stem cells in cancer, and that even if a causative role was shown, it hardly means that stem cells are the only factor involved. “Generalizing this to geographically disperse data does not undo this shortcoming,” he added. Last year, Wu and Hannun published a study in Nature that came to a vastly different conclusion. The researchers showed that cancer risk is heavily influenced by environmental factors, accounting for upwards of 70 to 90 percent of all cancers. The Tomasetti and Vogelstein study may be flawed, and it’s undoubtedly incomplete, but the idea that certain cancers are beyond our control is certainly an intriguing one. It makes sense that our bodies, outside of heredity and the environment, will on an unfortunate occasion produce a nasty cancerous cell that churns out more copies of its twisted self. Moving forward, scientists have the daunting tasks of figuring out how to predict these instances of cancer—if that’s even possible. In the meantime, you should still do your best to avoid cancer: eat healthy foods, maintain a healthy weight, quit smoking, and avoid carcinogenic environments.